Are you interested in owning an Anatolian Shepherd Dog? Then, your first task (of many) is to learn about the Anatolian Shepherd dog temperament. You have your work cut out for you with this breed. The Anatolian Shepherd is a challenging breed, but it is worth the extra effort. The Anatolian Shepherd was bred to be in charge of their master’s flocks without needing any further direction or assistance from humans. Therefore, the Anatolian Shepherd is a very independent breed. Because of this, you may discover some challenges when it comes to owning one of these dogs. Interestingly, there has been some debate about whether or not the Anatolian Shepherd is its own distinct breed. 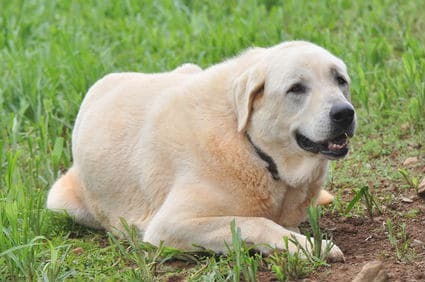 Some dogs that are considered to be very closely related to Anatolian Shepherds are the Kangal, the Akbash, and the Aksaray Malaklisi. 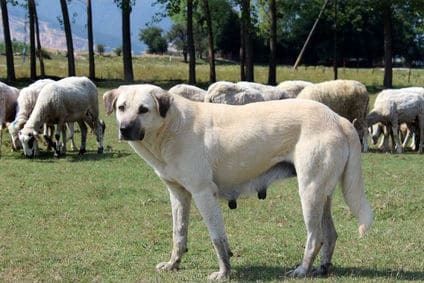 Some Turkish breeders consider the Anatolian to be a mix of the Kangal and the Akbash. Other registries actually consider the Anatolian Shepherd and the Kangal Shepherd to be the same breed. The general classification of “shepherd dog,” however, can be split up into two groups: herding dogs and livestock guardian dogs. Both can apply to the Anatolian. Other types of herding dogs include Border Collies, Australian Shepherds and Rough Collies while livestock guardian dogs include the Himalayan Sheepdog, the Tibetan Mastiff, and the Komondor. What type of work goes into owning a dog like this, you may ask? Well, for one thing, you need to socialize Anatolian Shepherds in order to make them into suitable companions. These dogs are definitely smart and can learn new tricks quickly. However, they may decide for themselves that they just don’t feel like listening to you. That's their Independent temperament trait showing up. They’re also very strong dogs. Turkish shepherds have reported seeing the Anatolian take on a wolf pack. And actually, bring down one or two of them. Because of their strength and agility, the Anatolian is not only a Proud dog but also a Confident one. You could almost imagine it puffing out its chest if you asked it to protect your flock. What’s good about the Anatolian Shepherd dog temperament, though, is that it is not one born from aggression. These dogs are independent, but they don’t get crazy about it. They simply act with conviction. Another aspect of the Anatolian Shepherd Dog temperament that is admirable is the fact that it does very well with kids. It will play with them inside and outside and will remain happy and content during long sessions of play. If you have very small children you may want to choose a different kind of dog because this breed is quite large and can inadvertently knock over a small child. For the older children, however, it will make an excellent companion. Importantly, Anatolian shepherds are roamers. It is strongly suggested that you both microchip and tag yours in case he decides to run off. It’s in their blood to seek out predators before predators can attack. This loving, gentle dog is suited to both indoors and out of doors but not for apartments. Wherever he is, the Anatolian will be quite possessive of both the home and the owner and strangers are treated with suspicion until the owner calms the dog down. He will not bite but he can be rather threatening. He likes to bark but properly trained it will not. They can do well with other animals (even cats). The key is to introduce them as puppies and also make sure they each have their own space. These dogs need a fair amount of exercise. An open backyard or lots of space to run is important for them. You can also take them on frequent long walks. This breed, both puppies and adults alike, would rather run and swim than play fetch. So, if you have intentions of taking your Anatolian to the beach to play fetch, he may disappoint you. Anatolian Shepherd dogs tend to grow rather slowly and will still act like puppies up to 1.5 yrs and 2.5 years old. After that: they mean business. If you want to get along with an Anatolian, you will have to start training it when it is a little puppy. Although highly intelligent, it can be rather stubborn if training is left for later. If not trained properly it can become a nuisance, refusing to obey commands and even behaving quite threateningly towards strangers. Its handler has to teach it that he and other humans around the house are in control and it must obey. Let your dog know that there is a line that cannot be crossed. However, heavy-handedness doesn't work with the Anatolian shepherd dog. If you are too harsh you will be met with blank stress and a refusal to obey commands. Be moderate and give praise when it is needed while at the same time showing your dog that you are boss. This is because this dog tends to be rather sensitive and it is easy to hurt its feelings. For help with training, you Anatolian Shepherd Dog take a look at The Online Dog Trainer by Doggy Dan. Doggy Dan is an expert Dog Trainer based in New Zealand. His online resource contains Hundreds of Excellent Dog Training Videos that will take you step-by-step through the process of developing a healthy, happy well-behaved dog. The agility and strength of this speed contribute greatly to the Anatolian Shepherd dog temperament. This breed is essentially the dog version of a lumberjack. It’s rugged, large, and incredibly strong. The American Kennel Club (AKC) considers the Anatolian to be a working dog. It has a well-developed sight and hearing to aid it in protecting livestock. The Anatolian is incredibly fast and equally agile. It to quickly find and take down any potentially encroaching predators. This dog is “muscular.” Their necks are thick, their heads are broad, and their bodies are stocky. Anatolian Shepherd height is quite tall! Males are usually between 26 and 31 inches tall, while females are typically 27 to 30 inches tall. The Anatolian weighs between 90 and 150 pounds. Males weigh in on the larger end of the spectrum and females at the smaller end. Their coats can be a variety of colors, though the most common ones are white cream, “sesame,”. Also common is white with large spots that don’t usually cover anything more than 30 percent of their bodies. They may also have a black mask and/or ears, but not always. The hair on an Anatolian’s neck is thicker in order to protect their throats. This makes sense if you’re hunting dangerous predators. Although they may look heavier than they actually are, thanks to their thicker coats. Like some of the other shepherd dogs, the Anatolian has a thick double coat. The coat needs to be brushed once or twice a week in warmer weather as a result of excessive shedding. The Anatolian typically lives, on average, about 10.75 years. This is on the longer end of the spectrum when compared to similar sized breeds. Other breeds usually only make it to between six and eight years old. The Anatolian Shepherd is also known to suffer Eyelid Entropion which means that the lower eyelid tends to roll inwards. It can also have Hip Dysplasia and Bloat. Be sure to speak with your veterinarian about these common Anatolian Shepherd health issues. The immunity in the Anatolian can take a long time to develop so you want to be sure that your dog gets all its vaccinations on time. Note: If you agree that your health and your dog's health should be a top priority then get a copy of The Ultimate Guide to Dog Health. Your Anatolian Shepherd Dog friend will love you for it. This guide will help save you money, time and most of all help you keep your dog healthy. 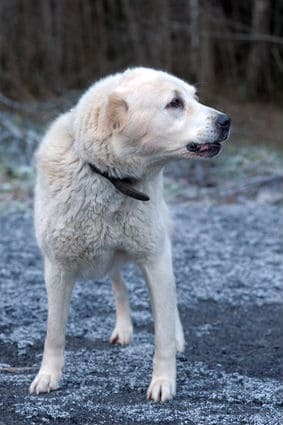 If you would like to add an Anatolian Shepherd to your family, please consider adoption first! There are already so many homeless animals in this country looking for good and loving homes. 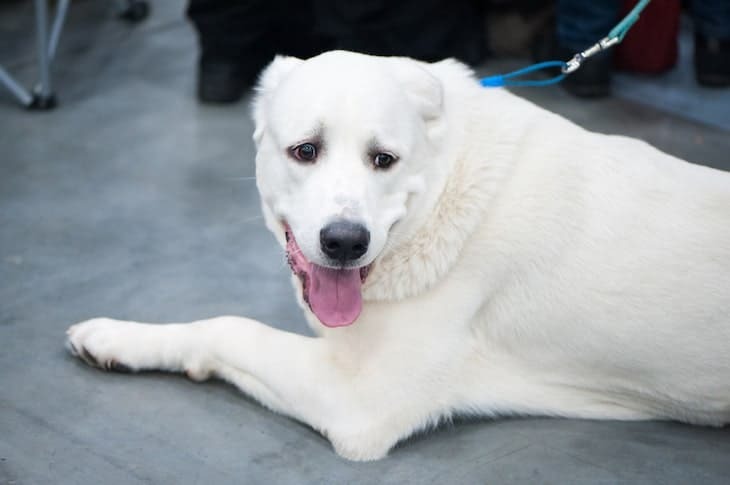 Visit the National Anatolian Shepherd Rescue Network for more information about finding an Anatolian Shepherd for adoption. Also be sure to visit your local humane society or animal shelter. Let the staff know that you are looking for an Anatolian Shepherd or an Anatolian Shepherd mix. Ask if you can fill out an application and leave it on file for the future. Also, let them know if you would be open to meeting similar breeds or mixes such as a Great Pyrenees mix. Visit Petfinder.com, Adoptapet.com, and Getyourpet.com to search for adoptable dogs as well. These websites will even allow you to set an alert so that you will receive an email if an adoptable Anatolian becomes available in your area. Facebook is another great resource for finding pets for adoption. If you acquire your dog through an animal shelter or rescue group, the adoption fee will probably be between $75 and $300 depending on the organization. Most rescued Anatolian Shepherds will come already spayed or neutered, vaccinated, microchipped and vetted. If you decide to purchase an Anatolian Shepherd puppy through a breeder, the Anatolian Shepherd price through a breeder will most likely be over $1000 and could be as high as $5000. It is important to do a lot of research to make sure you locate ethical Anatolian Shepherd breeders. Never purchase Anatolian Shepherd puppies (or any breed of puppies) over the internet or from a pet store. If you do, you may be getting a puppy from a puppy mill or a backyard breeder. A good place to start your search for a quality breeder is with the Anatolian Shepherd Club of America. You can contact a representative and ask for a list of reputable breeders in your region. You will still need to do further investigation before agreeing to buy a puppy from them. Make arrangements to visit the property and inspect the breeding dogs. Make sure the dogs appear healthy and seem to have sound temperaments. Ask to see medical records and the results of genetic testing. Ask the breeder about their contract of sale, return policy, and health guarantee. The breeder will have lots of questions for you as well. A good breeder wants to make sure that their puppies go to excellent homes. They will likely ask you to sign a spay/neuter agreement promising to get your pet altered at the appropriate age. They will also insist that you return the dog to them if things do not work out. A good breeder never wants any of their dogs to end up on the street or in animal shelters. If the breeder does not want you to visit their home and/or does not ask you any questions, this is a red flag. Keep looking for a different option. So Is The Anatolian Shepherd Dog Temperament Right for You? In a nutshell, the Anatolian Shepherd dog is a demanding breed. And will require time and effort from you. The Anatolian Shepherd dog temperament may be difficult to work with at first. What you need are patience and consistency. Mix those in with exposure to other animals. And lastly, give this breed room to roam ( just make sure you microchip him first).